MTN Welcome back offer is not something new to us, as it is an offer that rewards dormant customers for re-activating their lines. Customers that have spent 45 – 180 days on the network without performing any chargeable activity will be rewarded with a 2000% bonus on their first recharge in a month for 3 months. However, the MTN Welcome Back Offer has revamped as you can still get 2000% bonus on the first recharge in a month, and enjoy special data bundles for 3 months! I know you will like to understand how the new MTN welcome back special data plan works and who is eligible. MTN Welcome Back Special Data Plans allows you to purchase 4GB, 1GB, and 250MB data at N1,000, N200 and N100 respectively. This is one of the best offers that the telecom company has offered us. 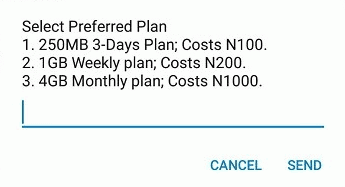 I’m going to share all you need to know about the new MTN 4GB for N1000 and 1GB for N200 and codes to subscribe to the new MTN special data offer. All MTN valid Sim cards can access this new offer, but not every MTN User is eligible for this new data offer. 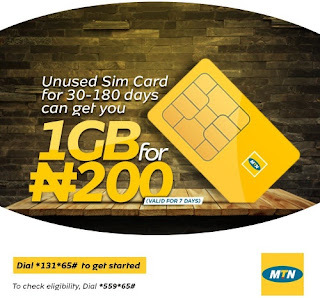 The offer is valid just for MTN customers who have not performed any rechargeable transaction on their Sim card for the past 30 days and above. The subscription code stated above works on all MTN Sim cards, but that is not the code to check the eligibility of the new MTN Welcome Back Special Data Plans. After dialing the code stated above, you are directed to the offer page that lists the available offers, but when you choose an option you’re directed to the next page which only tells you “Dear Customer, Enjoy data offers on MTN Deal zone, Dial *131*1#” and when you do so, you are directed to the main MTN data bundle offers that give you 1GB for N1000, 1.5GB for N1,200 and so on. Can I purchase multiple MTN Welcome Back special data bundle? For those that are eligible. Yes, you can activate multiple Welcome Back special data plans, but each data bundle purchased will have its own unique expiry dates. Will I still be able to subscribe for MTN data bundle plan? Yes, you will be able to subscribe to any MTN data bundle plan and enjoy all the benefits of the bundle you activated. It is as simple as it sounds. If you dropped your MTN sim card for this period of days, quickly clean up the dust and insert in your device to enjoy this promo. All MTN customers that have not made use of their SIM for a period of 3 months or 45 days will be rewarded with a 2000% bonus on their first recharge in a month, and enjoy special data bundles for 3 months.